One of the beginning steps in creating an adoption plan is to complete an intake. Please complete and bring all forms to your first session. These forms are required for your first session. Thank you. 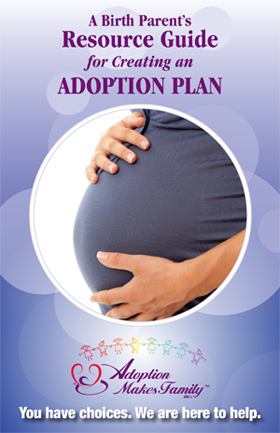 This is the intake necessary to assist in the creation of your adoption plan. To complete the intake, you will click on the words “PDF form here” and download the intake form. The information from this intake is strictly confidential. Adoptive families are not given any of your identifying information. They are only given information on your medical history so they can be better informed regarding the potential medical issues of the baby to be adopted. Please complete the form with as much information as possible. We have loving families who are open and willing to adopt a child from all types of backgrounds and medical conditions. Once we have received your intake form, we will set up a time for you to meet with a social worker at a time and location that is convenient for you. You will then be able to ask more of your questions and start the process of identifying a family who will be the adoptive family for your baby. Adoption Makes Family is a non-profit (501-C3) licensed adoption agency based in Maryland. Our adoption counselors are available 24 hours a day, 7 days a week for your convenience. If you would like our advice or just need to talk, please give us a call at any time. Or you may reach us at the text button located at the top left hand corner of your screen. Our caring and compassionate counselors are professionals with experience helping families make the right decisions for them and their children. Remember, you are not alone. Adoption Makes Family is here to help! Contact us to discuss your unplanned pregnancy. We’re here to listen, 24 hours a day, 7 days a week.